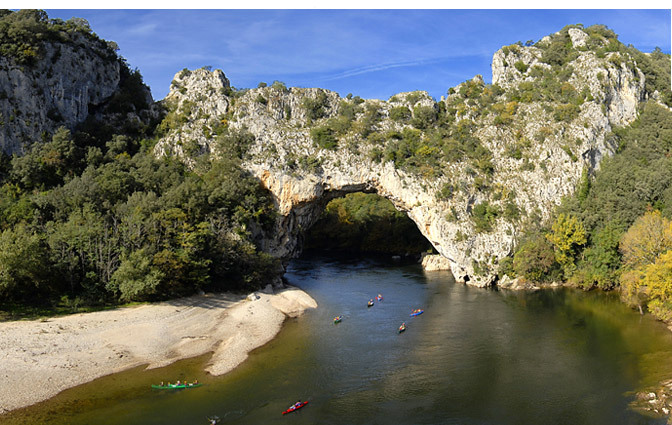 We arrived at Vallon-Pont-d’Arc, the entrance to the Ardeche Gorge and the start for many of their journey by canoe through a picturesque and magnificent landscape. 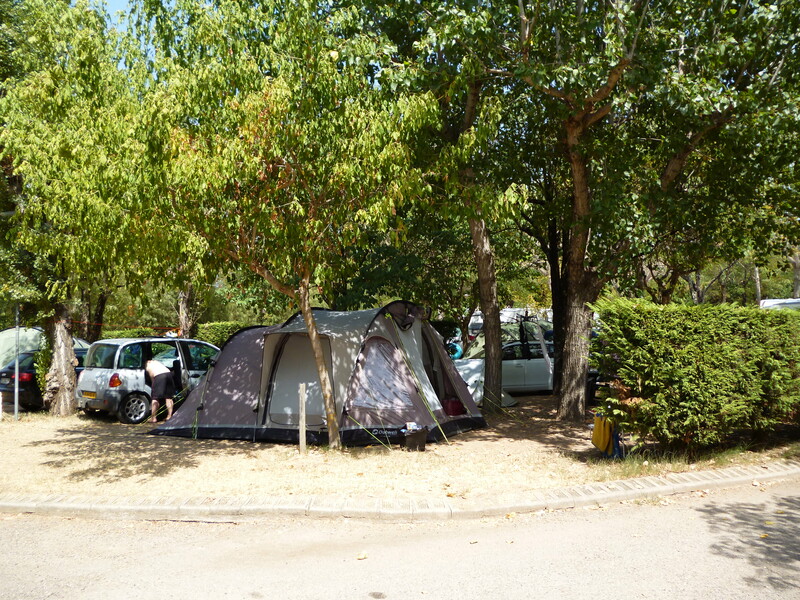 So to find a campsite, cheap, cheerful, not all singing, all dancing……well that was the plan but like all best laid plans we ended up at a large, relatively expensive (although the prices go down in the last week of August by a few Euros) site on the banks of the Ardeche river just outside the town called Mondial Camping. I’ve reviewed the campsite here: http://www.ukcampsite.co.uk/sites/reviews.asp?revid=12154. Once again we pitched the Outwell on a large, shady pitch just opposite the path to the river and then took a walk down the path for a quick swim; as it was late evening only a few canoes paddled by and, having negotiated the steep path, rocky shores and boulder strewn river bed with limited injury, we immersed ourselves in the cool, clear water of the Ardeche…….as a true water babe I was in heaven, my life was complete! To cut a long story short I made excuses everyday, for some reason I didn’t feel confident and felt my levels of fitness would see me being rescued and pulled to shore should I embark on such a venture. This made me sad, I’d had a go at most water sports with various degrees of failure (a pulled muscle water-skiing, a shark encounter that was really dolphins on a jet ski in Florida, windsurfing which I managed for around 3 seconds after hours of practice) but canoeing I’d been relatively successful at in the past so why I would suddenly feel this fear and lack of confidence did get to me. Bruce was indifferent about canoeing but I felt this indifference masked a similar lack of confidence as we’d had a fair few conversations on steering techniques whilst watching the Ardeche M1 for canoes from our perches on the rocks. We therefore left for home regretting that we had not taken the plunge (quite literally in our case) and canoed the fantastic Ardeche river beneath the Pont d’Arc, a natural bridge carved from the ancient landscape. The landscape is indeed ancient and in 1994 2 speleologists (which I presume is something to do with caves) discovered the Chauvet Cave with it’s remarkable 31,000 year old cave drawings. Due to it’s rarity and importance it isn’t open to the public but we did find a cave that was. On a hot day this was a cool retreat, in fact as we descended down the numerous steps I came to the conclusion that a vest top was totally inadequate and I shivered around the interior, listening to the French tour guide (my French is limited and I have very little knowledge of any cave related word). Geographically the caves were spectacular with stalagmites and stalactites and pools and waterfalls and an almost cathedral-like impressiveness about them…natures sculpture park. But no wall paintings and I guess as someone more interested in people (with a recent interest in all things archaeological) the geology was less exciting. Bruce was a bit peeved he couldn’t just nip out for a fag after we’d seen the first chamber of the cave and even more peeved to learn we had a few more chambers to go. But we were both glad we’d seen it and at least immersed ourselves in a bit of the landscapes history. Valon Pont d’Arc is a lovely old town with a thriving weekly day and evening market. An added bonus is that whilst we sat in the square sipping coffee and eating a freshly baked croissant, the Merry Go Round played some excellent chilled music including a fair bit of reggae. 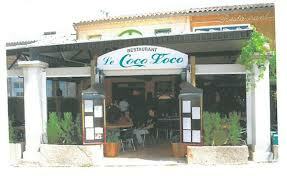 We had a meal one evening at a lovely restaurant Coco Loco in the town and spent another evening getting on down to the music at the campsite disco…..as is our tradition we managed to clear the dance floor with our moves and shakes. Although the campsite was fairly big and organised there was a laid back feel and the owners were very proud of their site. Another evening was spent drinking wine and watching the stars in our little rocky hideaway down by the river…….all very romantic and amorous until the river security guards spotted us, we managed to restore our modesty before they got to us and upon seeing us just wished us a good evening. They were intent on intimidating the naughty teenagers and obviously realized that 2 middle-aged, respectable, polite English people would be doing nothing more than drinking wine and star gazing…….little did they know! All too soon it was time to start the long journey home, we had left it as late as possible and decided to go from south to north in one go. 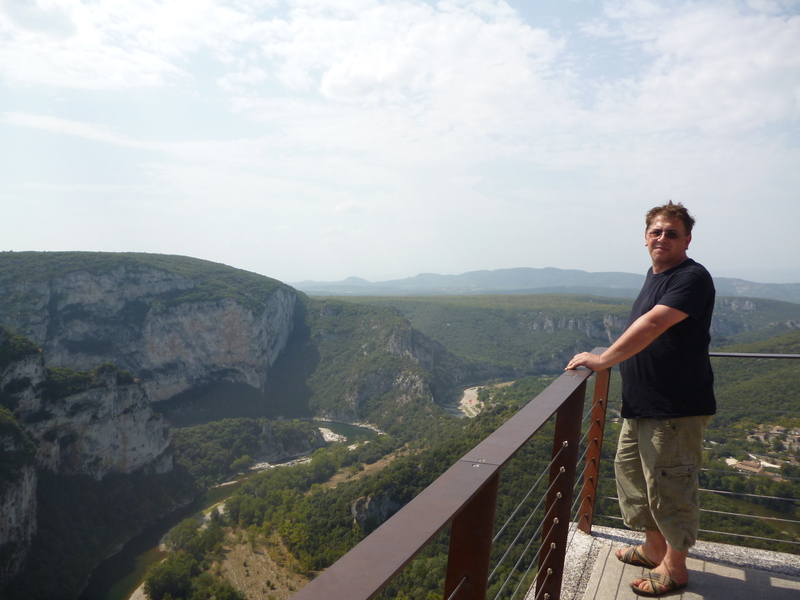 We left one of my now favourite regions of France, the Ardeche, at around 10am and by midnight we were on the tunnel train thing heading for a real bed and a good night sleep……would have swapped the real bed for an airbed in the sun of southern France any day. 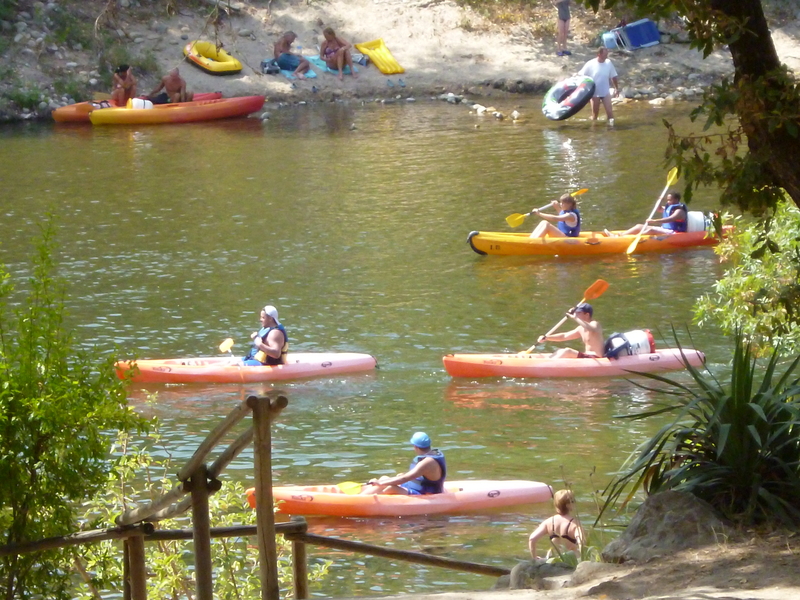 This entry was posted in Adventure, ardeche, Camp Sites, camper franc, Camping, camping france, camping UK, campsite, canoeing, Cuisine, France, Tent, tent france, Travel and tagged ardeche, canoe, cave, mondial, Outwell. Bookmark the permalink.